New owners include an investor group known for operating boutique hotels and student dorms in high-end markets. The Sutter Hotel is one of Oakland's few remaining single-room-occupancy hotels. 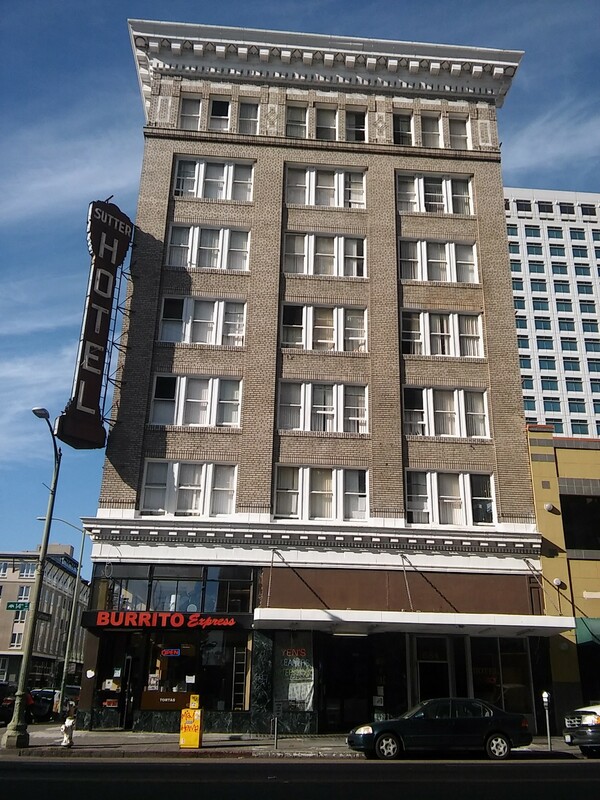 The Sutter Hotel, one of Oakland’s dwindling number of single-room occupancy hotels, was sold today to an investor group that includes two minority owners of the Oakland Athletics. These new investors are known for operating boutique hotels and student dorms in high-end markets — not affordable housing — and it’s unclear what they intend to do with the 102-room low-income housing property. This morning, a former Sutter resident told the Express that the hotel’s sale was contingent on the eviction of long-term, low-income tenants. “There was a concerted effort to remove people,” explained Michael Wiehl, who lived in the Sutter from 2013 until last year, when he was evicted. Wiehl said the hotel’s previous owner, Raj Singh, at first bought-out some of the permanent residents, and even helped others move to the nearby Empyrean Towers SRO. But he also evicted Wiehl and several hold-outs. Former residents told the Express that all of the permanent residents who were protected by Oakland’s rent control and just-cause eviction laws are now gone. Wiehl left in October 2016. Court records indicate that six other tenants were evicted through court actions last year, and two were evicted through the courts in 2015. “You’re dealing with a lot of powerful people who are trying to get to that Uber money and the Airbnb billions,” Weihl speculated about the sale. Laura Lane, an attorney with the East Bay Community Law Center, represented a different Sutter tenant in an eviction case last year. Lane said she noticed the previous owner paying rent-control-protected tenants to move out. “I know at the end of last year that [the landlord] had paid to relocate some people out of the hotel,” she said. City officials were reportedly in talks with Singh to try to purchase the Sutter, or use it on an interim basis as transitional housing for homeless people. But no deal was ever struck. City officials didn't respond to emails seeking more information about this effort. Singh didn’t return several messages, which were left with the front-desk staff at the hotel. But a person working the desk confirmed today that the hotel was sold, and that the new owners are immediately taking over. “We’re doing a big transition,” explained the individual, who did not identify themselves. They declined to name the new owners or elaborate. 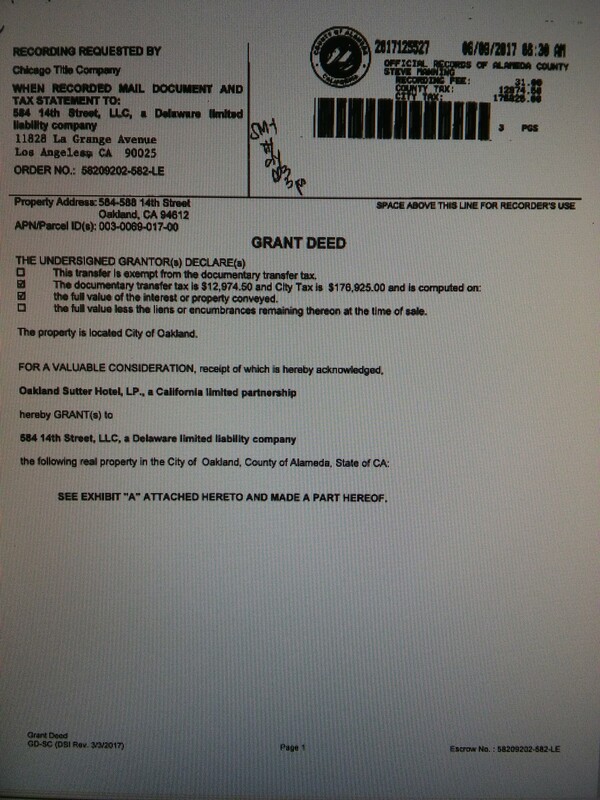 Grant deed for sale of the Sutter Hotel. But county records indicate that a company called 584 14th Street LLC purchased the building today for approximately $12 million. The LLC was incorporated by Hawkins Way Capital, a Los Angeles real estate investment company run by Ross Walker. Walker is part of the ownership group of the Oakland A’s baseball club, according to his biography on his company’s website. He also works closely with his former boss Lew Wolff, one of the more prominent minority owners of the A’s. Last year, Wolff stepped down as the managing partner of the A’s and sold off most of his shares in the team. But he retains a small ownership stake, and the title of chairman emeritus. For years he was the public face of team's ownership group. Wolff’s company, Wolff Urban Development, shares office space in the same L.A. building as Hawkins Way Capital, and Wolff Urban is an investor in Hawkins Way's real-estate deals. Today, Walker wrote in an email to the Express that it’s too early to share plans about what his company intends to do with the Sutter. The Express asked Wolff if he was involved in the purchase of the Sutter Hotel, to which he deferred to Walker. Wolff also wrote in the same email that his involvement in real-estate deals in downtown Oakland is limited to a proposal to build a new Marriott Hotel at 1431 Jefferson Street, which is across the street from the Sutter. Hawkins Way Capital owns boutique hotels and student-housing properties across the United States. For example, last year, the company bought Hollywood’s Mark Twain SRO hotel and converted it to market-rate housing. Hawkins Way also set up the Live Learn Properties Fund, which invests in student dormitories. Both Walker and Wolff are managers of the Live Learn fund, according to securities records. In the past year, the City of Oakland has been trying to preserve its SROs, because they are often the residences of last resort for people who would otherwise become homeless. In January, City Council passed a moratorium to prevent converting SROs into other uses. The moratorium lasts until December 2018. Oakland has lost almost half of its total stock of SRO housing units in the past twelve years. According to a September 2015 city report, Oakland had 31 SRO hotels with 2,285 rooms in 2004. Since, some were demolished to make way for new developments and others were converted to different uses, leaving only 1,311 SRO units in Oakland today. Last year, the Hotel Travelers and a smaller SRO building on 8th Street were both purchased by investors who plan to convert the buildings into market-rate properties.